When becoming a licensed Ham a few years back, I learned that when broadcasting over amateur bands, the FCC requires you to transmit your station identification at the beginning of each session and then at least once every ten minutes. 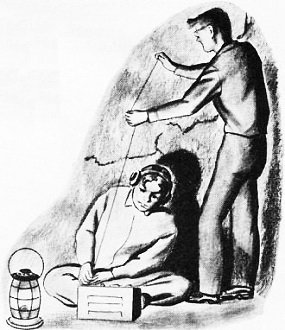 I hate to nit pick a Carl & Jerry story, but in this episode John Frye's intrepid electronics hobbyist duo rigs up their basement 'shack' to automatically transmit the letter 'A' in Morse code as a beacon signal to test reception in a cave. A timer would start the broadcast and it would run continuously for half an hour. Maybe things were different in 1961. 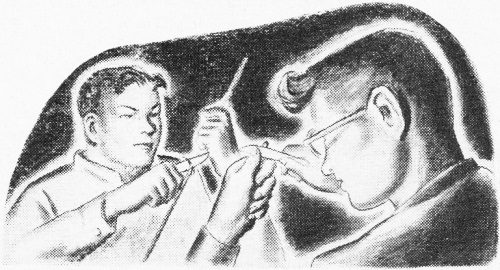 The experiment intended to test a signal's ability to propagate through the Earth rather than through the air. It is an interesting twist on the skin effect of high frequency signals along a conductor. 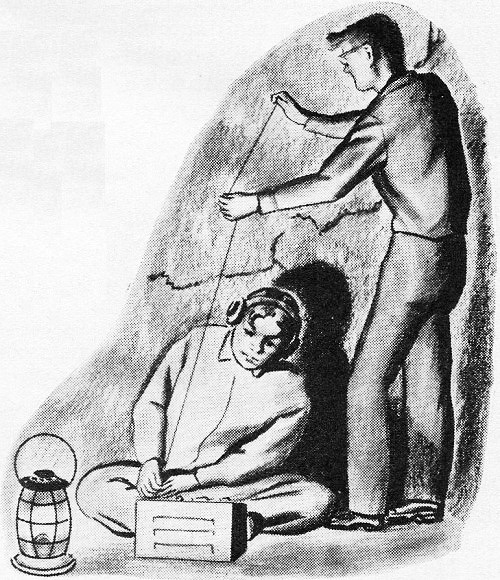 As you might suspect, the plan did not go exactly as intended, requiring Carl and Jerry to apply a bit of radio knowledge to get themselves out of peril. Spoiler Alert: This story comes ironically right after posting the item about engineers using balloons to send an antenna wire up through a smokestack. Carl and Jerry were riding along the river road on a beautiful afternoon in early May. Carl was driving, and Jerry was sitting beside him holding a compact battery-operated 75-meter transceiver on his knees. The bright day seemed all the brighter because it had arrived after almost a solid week of heavy rain. "Jer, do you think we'll be able to hear that transmitter back in our laboratory?" Carl asked. "I'd hate to say," Jerry answered. "We'll only be four or five miles from it, and it'll be running a hundred and fifty watts input; but a transmitting antenna consisting of the outside shield of fifty or sixty feet of RG-8/U coax cable running inside a sewer isn't the best radiator in the world. You said the signal was only S3 at your place right next door. "But from what I've been reading," he continued hopefully, "it's barely possible we may be able to hear the signal down in that limestone cave along the river. Anyway, if we can't hear the signal, we can do some plinking with your .22; so the afternoon won't be wasted." "That coax pushed into the basement drain a lot easier than I expected," Carl observed; "and it certainly loaded the transmitter. What time did you set the timer to turn on the transmitter and start the automatic keyer?" "Three o'clock. That will give us plenty of time to rig up an antenna inside the cave. The transmitter will send 'A' over and over for a full half hour before shutting itself off." "Has anyone had much luck sending radio signals through the earth?" "Well, in May, 1959, the Space Electronics Co. people sent a message from an abandoned borax mine at Boron, California, to a point more than 100 miles away. During the past thirty years many individuals and commercial concerns in different parts of the world have carried on experiments designed to send signals through the earth; until recently, though, most of them have been failures or very limited successes. "But the attention paid to this kind of communication has increased sharply the last few years. The military is very much interested in a transmission system buried deep in the earth and not dependent on vulnerable transmission lines, relay towers, and so on. Even an atomic attack could not destroy such a system. Millions of dollars are being spent on underground radio communications experiments right now." "How did Space Electronics send the message?" Carl wanted to know as he pulled the car off the road and parked it beneath an overhanging limestone cliff. "The signal from the transmitter went up to the earth's surface and excited the ground-atmosphere interface. Because of the discontinuity between the conducting earth and the non-conducting atmosphere, the waves traveled along this interface in a manner similar to the way a high frequency travels along the outside surface of a conductor. When the signal came to a point above the receiving station, it went down through the earth to the receiver." "Is that the way you think the signal will travel from our sewer antenna to the cave?" "No, I'm hoping we may hear the signal through waveguide action. You see, beneath the earth's topsoil are layers of sedimentary rock - some wet, some dry. The wet layers act as the bound­aries and the dry layers as the interiors of natural wave guides, and a radio wave of the proper frequency can go along between two wet layers just as a u.h.f. signal goes along a metal wave guide. Right now the soil itself is sopping wet with the rain. I'm hoping that the soil will form the top and that a wet layer of sedimentary rock down below will form the bottom of a wave guide which will lead the signal right into our cave. It'll be more luck than sense if it does, but we'll never know until we try." "Okay," Carl said as he got out of the car. "I'll take the rifle, the gasoline lantern, and the bundle of dowel sticks; you bring the transceiver and that old field coil from a dynamic speaker. We want to string up as much antenna as we can, and there must be half a mile of fine wire on that coil." The began walking down the steep path that led to the river and the cave entrance, but they started to slide and ended up on the rocky ledge bordering the stream amid a small landslide of loose stones and muddy earth. "Whew!" Carl exclaimed as he picked himself up and brushed off his clothing; "that ground is sure soft. It's a good thing the rain stopped when it did or the road would be sliding down into the river." A few minutes later they were back a couple of hundred feet in the narrow, twisting cave that ran into the limestone bluff. "Guess we may as well set up shop here," Carl said as he held the lantern high above his head and looked around. "I've never gone beyond this point myself, but I think the cave peters out pretty quickly. You check out the receiver, and I'll string up some wire for an antenna." The boys had brought along the transceiver because it contained the only battery-operated receiver they had. Jerry placed it on the dry floor of the cave and prepared it for operation. Carl stuck short pieces of the small dowel stick into crevices in the cave walls and strung the fine enameled wire stripped from the speaker field coil on these crude but adequate insulators. He snapped the end of the wire loose from the spool, and Jerry scraped off the insulation and fastened it to the antenna post of the receiver. They tuned the receiver back and forth across the 75-meter phone band and the adjacent 80-meter c.w. band with the beat frequency oscillator turned on, but were unable to hear that first weak heterodyne even though they knew the band must be busy on a Saturday afternoon. "Well," Jerry observed, "if we hear anything, it's going to have to be our own transmitter, which should be turning itself on about now. Listen hard." He turned the gain full on so that the cave was filled with the loud hissing of the sensitive receiver, but not a trace of a signal could be heard on the 3780-kc. frequency of the automatic transmitter. They tried putting a ground on the receiver. They tried shortening the antenna. Finally, they even carried the receiver to the other end of the antenna and connected it there. Nothing made any difference. Not a sound, outside of the heterodyne hiss, could be heard. "Well, that's that," Jerry said as he glanced at his wrist watch and shut off the receiver. "The transmitter will cut itself off now." "It may as well," Carl growled. "All it did was warm the fish worms with the r.f. Let's take the rifle and -"
He was interrupted by a low rumbling sound that seemed to come from the distant mouth of the cave. It continued for several seconds and then stopped. "Earthquake!" Carl shouted, leaping to his feet and heading for the cave entrance at a lope. Ordinarily Jerry was not as quick as Carl, but this time he was right at his chum's heels when the former sprawled headlong and smashed the lantern he was carrying. The cave was plunged into darkness. "Quit walking on me!" Carl said indignantly, pushing Jerry off him and scrambling to his feet. He took a flashlight from his pocket and turned it on. The beam revealed a tapering wedge of mud and loose stones that went from the floor of the cave all the way up to the roof. In his haste, Carl had slammed into it. "Wow!" he exclaimed in awe. "An earthslide has covered the cave entrance. We're in a bind now." "Yeah," Jerry agreed. He took the flashlight and carefully inspected the wall of mud still oozing toward them and the sides of the cave. "I remember that this turn was ten or fifteen feet inside the cave," he announced; "so we know the wall of earth is at least that thick. We could never dig through it without tools." "Someone will find our parked car and start looking for us, won't they?" Carl asked in a hoarse voice that abruptly squeaked on the last word he spoke. "Maybe, but where will they look? They'll never think of this cave now that the entrance is covered up. Actually, not too many people know about it anyway. But let's not hit the panic button. Let's go on back to the transceiver." "Lot of good that will do us," Carl muttered as he examined the shattered mantles of the gasoline lantern. "Strong signals can't even get into this hole; so our four or five watts have a fat chance getting out. I'm going to do a little exploring farther back in the cave. Maybe there's another way out." Carl went ahead with the flashlight, and Jerry was right behind him. 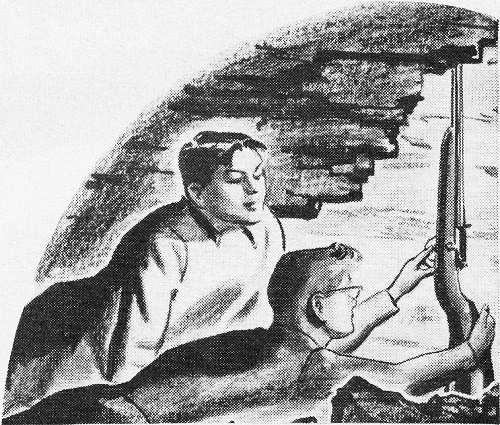 The walls of the cave narrowed quickly, and soon the roof dipped down until the boys had to stoop to proceed. "It ends in a solid wall about ten feet ahead," Carl said over his shoulder. "Hey, wait a minute!" He scrambled ahead on his hands and knees and then bent his head back and looked upward. "Jer!" he exclaimed, "I'm looking right into a sort of chimney that goes straight up through the rock. It's about three or four feet across, and I'd guess it was seventy-five to a hundred feet to the top; but I can see blue sky up there, and is it ever pretty!" He backed out and let Jerry crawl into the narrow space to examine the opening. "Well, at least we won't suffocate," Jerry concluded as the boys returned to where they could stand erect. "Maybe we could build a fire and someone would see the smoke," Carl suggested hopefully. "We could if we had something to burn and if the smoke didn't smother us before anyone saw it," Jerry discouraged him. "How about yelling up the chimney?" "Think hard. We've been up on that bluff above the car. Try to picture where the top of this opening must be." Carl nodded glumly. "Yeah, I know; it's right in the middle of that big briar patch. No one but rabbits would be traipsing around in there." He turned off the flashlight to conserve the batteries, and the two boys sat silent in the pitch darkness. "If we just had some way of getting a wire outside for an antenna, we could use the transceiver to get help," Jerry mused. "How about your throwing a rock with a wire tied to it up through that hole?" "Oh, sure! Should I do it lying on my back or toss it up over my shoulder while I'm on my hands and knees?" Carl asked sarcastically. "Whitey Ford himself couldn't throw a rock up to the top of that hole in the position he'd have to take. We need a trench mortar - Hey! That's it! Turn on the light and start shaving down one of those dowel sticks with your knife until it will fit loosely in the barrel of the rifle. Get a move on. The state traffic net meets in forty-five minutes, and Chuck, back in town, is net control tonight. If anyone can hear us, he will." While Jerry was working down the dowel stick, Carl pried the lead bullet from a .22 cartridge and sealed the powder in the case by shoving the sharp edge of the brass case through a cake of chewing gum. This was inserted in the chamber of Carl's bolt-action rifle, and the long, slender wooden stick was pushed down the barrel until the end was resting against the chewing-gum wadding. Next, Carl stripped fine wire from the field coil and carefully arranged it in a huge spiral directly beneath the vertical opening. The end of the wire from the center of this flat coil was securely fastened to the wooden stick at the point where it emerged from the muzzle. Finally, Carl used loose rock to wedge the rifle securely against the side of the chimney with its sights aimed squarely at the center of the blue patch of sky above. "I guess we're ready," Carl said to Jerry. Carl pulled the trigger, and there was a muffled explosion. The coil of wire disappeared in a blur of motion except for a dozen or so outside turns. "That did it!" Carl said joyfully as he peered up the opening. "We must have had three or four hundred feet of wire in that coil. Fasten the end to the transceiver and let's see if we can hear anything." This took only a minute, and the boys grinned triumphantly at each other in the yellow glow of the fading flashlight as Jerry tuned across the crowded 75-meter band and heard signal after signal coming in loud and clear. He threw the switch to "Transmit" and checked the transmitter loading; it wasn't too good, but splicing in some extra wire brought a current loop to the transmitter terminals and enabled the transmitter to draw its rated current. By this time, their friend Chuck was already calling the roll of net stations. Jerry carefully zeroed on the frequency, and when Chuck stood by for "any station with traffic," Jerry broke in with a "QRRR." Chuck acknowledged him instantly. "How are we coming in?" Jerry asked. "Like gang busters. What's wrong?" Jerry explained the situation, and Chuck told him to stand by while he did some telephoning. In five minutes he was back with the news that the sheriff and some other men were on their way. The two boys sat in the darkness and listened to the net while they waited. It did not seem quite so lonely with the familiar voices of their ham friends echoing around the cave. It was only a half hour later that they heard the voice of the sheriff calling down the shaft. A rope was lowered, and first Jerry and then Carl was pulled to the top. When the boys tried to explain what they had been doing in the cave, the sheriff just shook his head in bewilderment and said, "Never mind. Just go on home and stay there!" 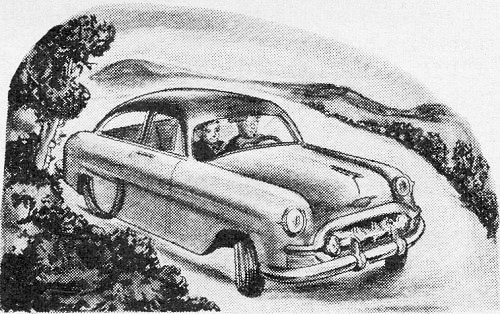 Minutes later, as Carl drove back along the river road, Jerry remarked, "Well, I'd not call 'Operation Worm Worming' a great success, would you?" "No," Carl said with a shiver, "but I'm not complaining. For a while there I thought it was going to turn into 'Operation Worm Feeding,' with us on the menu. What say we leave underground radio communication experiments to Space Electronics and others?" Carl & Jerry: Their Complete Adventures is now available. 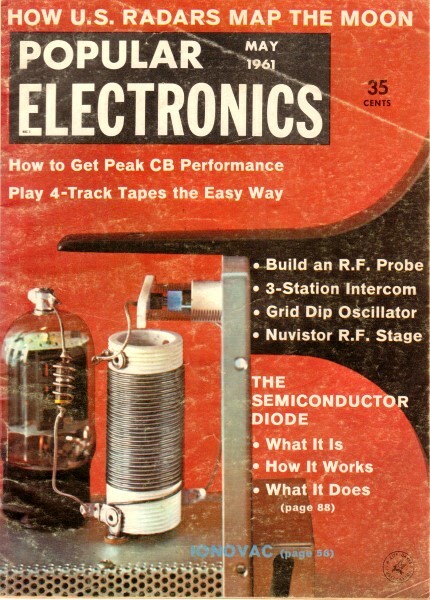 "From 1954 through 1964, Popular Electronics published 119 adventures of Carl Anderson and Jerry Bishop, two teen boys with a passion for electronics and a knack for getting into and out of trouble with haywire lashups built in Jerry's basement. Better still, the boys explained how it all worked, and in doing so, launched countless young people into careers in science and technology. Now, for the first time ever, the full run of Carl and Jerry yarns by John T. Frye are available again, in five authorized anthologies that include the full text and all illustrations."